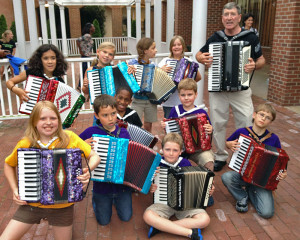 Accordion for Kids, USA is a no cost introductory program that is an opportunity for boys and girls 8-12 to test their interest in playing the accordion, and it’s free! Yes, for six weeks, without charge, each student participant will be lent a 12-bass accordion, DVD or VHS of the ABC Accordion Video Course for Beginners©, music stand, and music course booklet. A modest deposit on the loaned items will be required. With individual, group, and programmed instruction, the child will enjoy a positive musical experience. Following a culminating recital and awards ceremony, the ​teacher will schedule an appointment with parent/guardian to discuss student’s progress and interest in continuing instruction or returning loaned items. There is no obligation, just a great opportunity. Contact Dale Wise at 540-854-5209 for further information. One of the Accordion Renaissance community service outreach programs is providing accordion lessons and entertainment to our wounded warriors. A pilot program was established at Fort Eustis, Virginia in 2015. For further information contact Jim Rice: 757-880-3308.